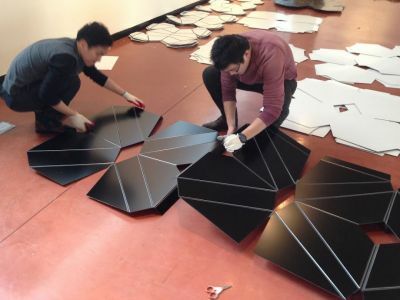 Graduate students were “Bending the Rules” in a recent exhibit at the Pratt Institute’s School of Architecture in Brooklyn, N.Y., with four full-scale architectural design pieces fabricated with Dibond aluminum composite material (ACM). The “Bending the Rules” exhibit – displayed Jan. 30 through Feb. 14 in the Hazel and Robert H. Siegel Gallery in Higgins Hall – was the culmination of students’ work in the fall 2013 “Scripting and Form” seminar in the Pratt Institute’s Graduate Architecture and Urban Design (GAUD) program. 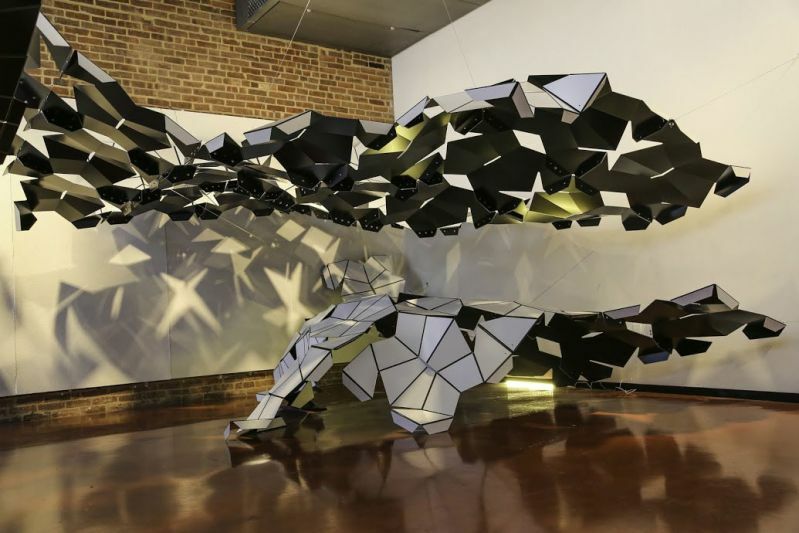 The seminar – taught by Robert Cervellione, visiting professor and coordinator of digital instructors, Pratt Institute GAUD – focused on the use of computer-based parametric design tools to model and simulate material behavior, specifically adaptive foldable structures. The design and conception of each project blended computational design tools as well as traditional techniques of paper folding. “By utilizing advanced computational design tools, it allowed for complex fold and cut patterns to be generated and simulated at large scales in order to predict real-world behaviors,” said Cervellione, who has taught this seminar for the past three years utilizing Bentley GenerativeComponents software. While Pratt architectural students may expect to incorporate Alucobond aluminum composite in their future professional building designs, the heavy-duty building product was not a practical choice for construction of these architectural sculptures. So, Dibond – Alucobond’s lighter-weight graphic display sister product – stepped in. Dibond graphic display board is a rigid, durable aluminum composite material consisting of two pre-painted sheets of 0.012-inch aluminum bonded to a solid polyethylene core – a unique composition that makes it approximately one-half the weight of aluminum. Dibond is available in the standard 2mm, 3mm and 4mm thicknesses. As the flattest panel on the market, Dibond offers a superior surface for displaying digital and screen-printed graphics. Dibond won’t bow or oil can. And, Dibond products offer significant cost savings, ease of fabrication and rigidity when compared to other aluminum laminates. In addition to computer design, seminar students completed all material fabrication and installation for the “Bending the Rules” exhibit. Before fabricating the large-scale pieces, students constructed lower-cost models with 10 sheets of 48-inch by 96-inch Sintra® graphic display board by 3A Composites USA in the Bright White color and 3mm thickness. The large-scale “Bending the Rules” pieces were created from 110 4-by-8 foot 4mm thick Dibond panels in the black facer/black core/black facer color configuration. 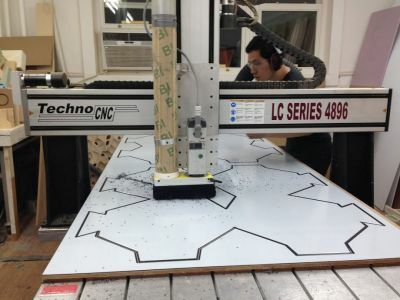 Students cut the Dibond with a CNC router into 220 1-by-1 meter panels that were scored for folding into the installation designs. The 1-by-1 meter Dibond panels were joined together with 3M™ VHB™ Tape – another real-world building construction product. Cervellione said the “Bending the Rules” exhibit is of interest not only to building design and construction professionals but to members of the general public.